Click Here to search other Lake Properties throughout Wisconsin! Okauchee 1,187 Good Active, social environment. Offering restaurants and social events. Public boat ramps. Lac La Belle 1,117 Very clear Strong sense of community.Becoming premier area.Public boat ramps & city beach. Nagawicka 957 Good Active with state park on its eastern shore creating picturesque border. Heavily used. 2 public boat ramps. Oconomowoc 767 Very clear Exclusive; upper-income residences dominant; social activities through the Oconomowoc Club. No public boat access, but boaters can gain access via a ramp on the Oconomowoc River. Pine 703 Very clear Private feel; large, gracious estates; elegant. Newly acquired public boat launch. Surrounded by mature tree shoreline. North 437 Very good Quiet; "up north" ambiance; exclusive. Larger parcels and great sense of community. No public boat access. Beaver 316 Excellent Upscale; quiet. Know for its turqoise color water and pristine shoreline. Magnificent estates.Carry-in boat access only. Upper Nemahbin 283 Very good Scenic; natural shoreline gives "north woods" feel. Boat ramp on channel between Upper & Lower Nemahbin. Lower Nemahbin 271 Very good Tranquil fisherman's spot. Access same as Upper with an additional carry-in access. Sandy shorelines. Silver 222 Excellent Undisturbed feel; unbuildable southwest quarter sustains sense of privacy; weekend restrictions. One public boat ramp. Upper Nashotah 133 Excellent Very exclusive; majority ownership held by Nashotah House; few homes; Larger wooded parcels. Carry-in boat access only. Lower Nashotah 90 Excellent Private. Carry-in boat access only. One of few supporting trout. Exclusive lake with up north feel. Moose 81 Excellent Neighborhood feel; mix of larger new homes and quaint summer cottages. No public boat access. Fowler 78 Good City lake, yet quiet and scenic. Two-mile walking/biking bath around the lake. Public boat ramp and city park. Pretty Lake 54 Excellent A great feel of small town community and year round lake homes. Good fishing and public boat ramp. Hunters 65 Good Perfect private lake for a quiet getaway from one of the areas finest subdivisions- The Preserve at Hunters Lake. Golden 258 Good A hidden treasure located just on the Waukesha /Jefferson county line. Public boat ramp. Upper Genesee 37 Excellent Private feel. Non-motorized and quiet. Great for your canoe and has terrific fishing. Carry on access only. Middle Genesee 93 Excellent Largest of the Genesee Lakes this lake offers peaceful serenity and a "Up North" feel with large lake parcels. Lower Genesee 62 Excellent Private Feel. Just south of Middle Genesee it offers the same "up north" feel with is quaint cottages and larger east shore lots. Keesus 227 Good Private up north feel. Strong lake community. Cottages, updated homes and new construction dot the shoreline. Public ramp. Waterville 68 Average Private offering "Subdivision" type lake living with larger homes and well manacured mature lots. Good swimming & boating. Pewaukee 2,493 Good Active; social; heavy public use. Lake Country's largest and most popular lake. 2 public boat ramps and carry-in access. If you are selling a lake property, it is even more important to have a Realtor that is knowledgeable about lake living and DNR rules representing your property. 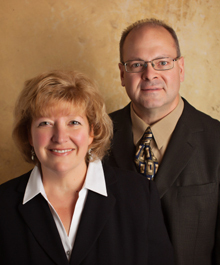 Doug & Lori are proud to be Top agents at First Weber. First Weber has the marketing tools & highly trained agents to get your home sold for the highest amount in the shortest time possible. Check out our State of Art 3D Tours & Drone Technology! Find your place by the Lake today! 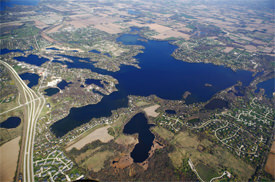 Search lake properties throughout Wisconsin. We are your local property experts!